If you are a fan of Bollywood movies, you’ve probably seen this place plenty of times as a backdrop. Built in red stones, these umbrella-shaped cenotaphs date back to 1770 AD. The locals call it “Chattardi” literally meaning umbrella and these were originally built to pay homage to the deceased of the royal family. The ones dedicated to Rao Lakha Rao Rayadhan, Rao Desai and Rao Pragmal are the most prominent. On your visit to Bhuj, visit the Bhuj Chattardi and you can also click dramatic photos around these striking structures! Early morning hours or early evening hours are recommended to visit the place. How popular is Bhuj Chattardi? People normally club together Hill Garden and Hamirsar Lake while planning their visit to Bhuj Chattardi. Intense. Currently in ruins. But art lovers can spot the beautiful paints left on few parts.. craftsmen are working to restore it back to beauty. 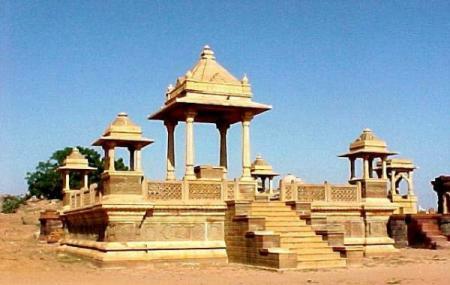 It is one of the main attractions of Bhuj. Nice quiet atmosphere to spend quality time with friends and family The Garden is very beautiful. It has tremendous history. The best time to visit this place in the early morning or evening. The place is in ruins stage standing alone in middle of the town which got destroyed in an earthquake. Though restoration work is still underway. The place is peaceful and quiet as it doesn't see many tourists, as most of the people don't know about this place. The best time to visit this place in the early morning or evening for watching sun rise or sun set. For locals and neighbourly people... it's Perfect place to chill on weekends, spend quality time with friends and family in garden for leisure. Superb place. Huge collection of old monuments and one can easily see our past and can admire. The conditions for monuments are in weak condition and need to give special attention to preserve them further generations.